As a huge wine non-snob, my first stop in the grocery store is always the wine discount shelf. The way I look at it, it’s like the store paid me to age their wine. Win-win! During a recent trip, however, my interests in wine and marketing collided as I spotted two wines from the same brand, Mia’s Playground, sporting wildly different labels. As you can see in the photo, their Cabernet, on the left, has a fun, playful, non-intimidating label, while the chardonnay on the right has a more serious, formal design. 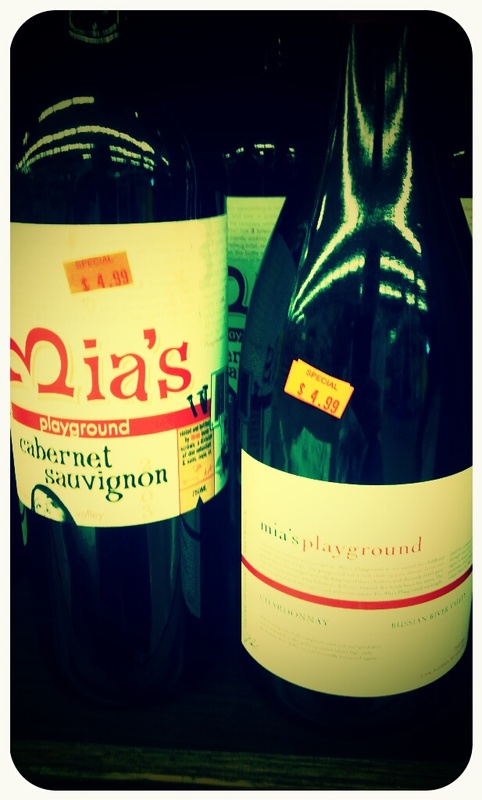 I’d never heard of Mia’s Playground wine, but at $4.99, pretty much any wine is worth a shot. A quick web search shows that Mia’s chardonnay usually retails for $16, while their Cabernet goes for about $15. That’s a pretty steep discount, and makes the differences in the labels even more interesting. Why are two wines priced similarly yet sporting different label designs, and why are they both heavily discounted? Is this Mia’s A/B test gone horribly wrong? Are they trying to position the different varietals for different market segments? Since wine is a $32.5 billion industry in the US alone, it’s no surprise that plenty of research has been put into wine marketing. Think about the logistics of the typical wine purchase: it’s highly-subjective, there are tons of choices, even at small stores, and each wine has a new vintage every year. As a wine consumer, you’d probably lean towards known wines that you’re familiar with (which just increases the marketing efforts required by competing wines) or, without additional information (like reviews or Wine Spectator scores), you’d just choose the one with the best marketing+price combo. Another study found that “there is little to no correlation between wine label design aesthetics and price.” However, this study focused more on font, colors, and layout over label content, and was written by an undergrad (gasp!). One interesting finding of their research was that tasting scores by Robert Parker were higher for wines with labels that were designed in a top-to-bottom format over a left-to-right format. What’s up with that? OK, I’m off the rails here. Back to Mia. The brand is produced by Don Sebastiani & Sons. Having worked a stint in the wine industry consulting for Robert Mondavi Wines, I immediately recognized Sebastiani as one of the biggest wine producers in the US. With 1.3 million cases sold in 2011, that puts them at #14 on the Wine Business Monthly list of the largest North American wine producers. Sebastiani’s website has them at 2 million cases in 2007, so the Great Recession has, apparently, not been kind. Their most-recognizable brand is probably Smoking Loon, but their website shows nine brands, of which Mia’s Playground is not seen. Digging deeper, I found that Mia is actually Don Sebastiani’s daughter, and that her name also adorns a wine-based cooking sauce. Wine.com shows Mia’s Playground as “no longer available,” and they and Snooth.com list vintages from 2002 through 2008. Marketing plays a huge role in the wine industry, obviously. This wine industry publicist says that 2% of a wine’s retail price is dedicated to marketing, which translates into $650 million spent on wine marketing in the US. With that amount of spend, there’s definitely room for consultants, focus groups, and, yes, even A/B testing. More googling seems to indicate that Mia’s Playground switched label designs with the 2005 or 2006 vintage from the fun version to the serious version, maybe in an attempt to spur sales or justify the price. It’s very telling about the US wine consumers’ palate (or wallet) that 94% of wine sold is under $14 per bottle. Or, maybe it’s indicating that, for those who are willing to spend more than $15 for a bottle of wine, price ceases to be a key decision-making factor? Either that, or I’ve been over-paying for wine for the past 10 years. Mia may have simply been another victim of the Great Recession, since the timing fits perfectly. As the economy started to slow, and instead of lowering the price, Mia tried to up-level her brand with a serious label befitting a $15 wine. With a 2008 vintage hitting the shelves in 2009, and with Sebastiani’s sales dropping 35% between 2007 and 2011, Mia’s bosses may have had to cut under-performing brands. In any event, wasn’t this a fun exercise!? Let me know what you think with a comment below. What Makes an Accelerator Work?